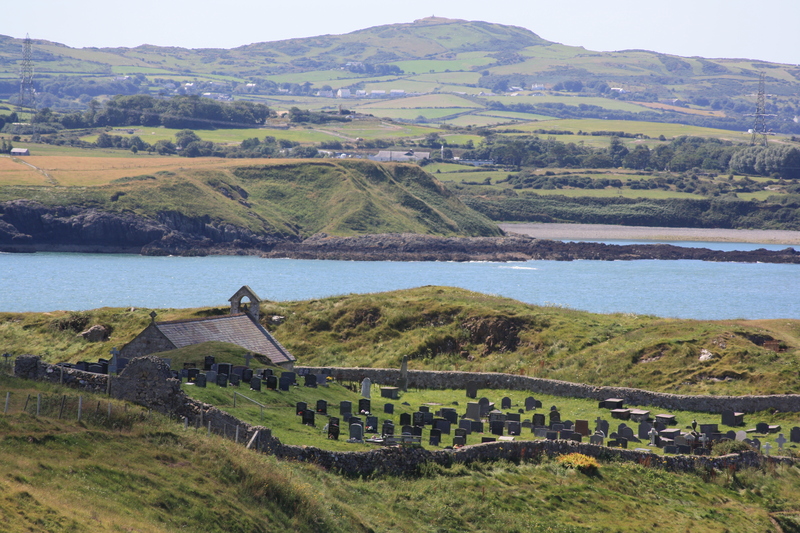 St Patrick’s church at Llanbadrig stands high on the cliff tops looking out across the Irish Sea and the Wylfa power station near Cemaes. A wedding was just finishing as I arrived and I waited as guests released mauve helium balloons which floated away along the cliff top path. The church is built most inconveniently upon a cliff washed by the Irish sea, and so near the sea that during the prevalence of northerly or north-westerly winds, the waves break over it with such violence, as to interrupt, and frequently to prevent the performance of divine service, and even the funeral service has been unavoidably deferred for several days, during the continuance of those winds, at which times the church is altogether inaccessible. St Patricks has popularly always been associated with the Irish patron saint, its feast day occurs on March 17th. 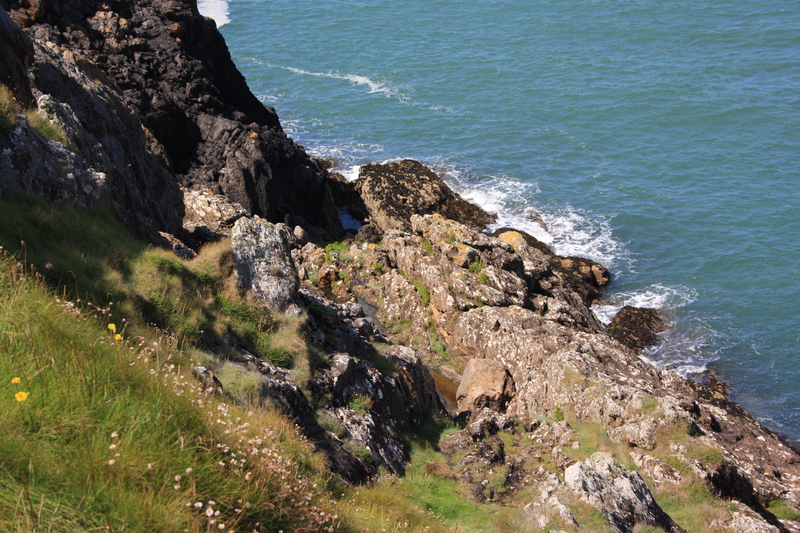 One story has it that he was shipwrecked on the small rocky outcrop known as Middle Mouse or Ynys Badrig, a hundred yards or so offshore. He managed to swim ashore where he found a welcoming cave and spring of fresh water. Thanking God for his unlikely survival he founded this church on the spot. The more mundane though probably more realistic alternative is that this was the bay from which he set sail on his journey to Ireland. More usual now is to attribute its founding instead to Padrig ab Alfryd of Arfon. Francis Jones in his Holy Wells of Wales attributes the well to this saint, following the line of Baring Gould and Fisher’s Lives of the British Saints. Bartrum’s 1993 Welsh Classical Dictionary also gives Padrig ab Alfryd as the church’s titular saint. [2,3,4] Padrig was a member of Cybi’s community at nearby Holyhead. 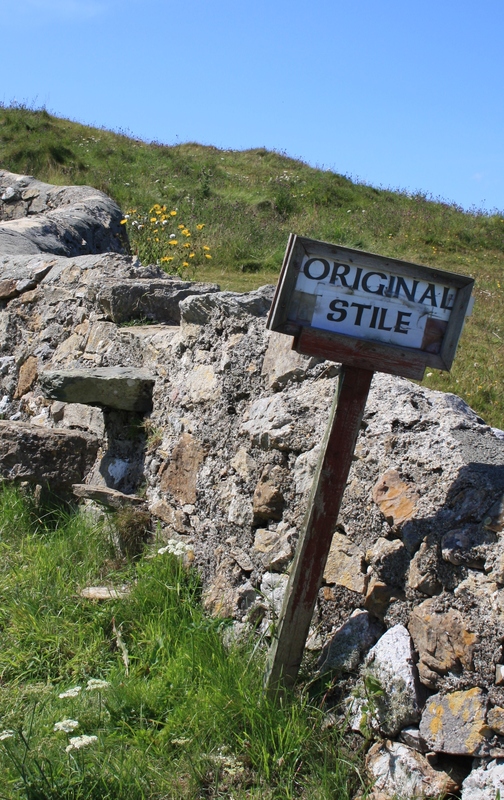 Deborah Crawford  has recently put up a very spirited and convincing argument for the reassociation of the site with the Irish apostle. I tend to think that this is the correct attribution, although it is not my purpose here to take sides. The well and cave are on the headland between the church and the sea. Neither is particularly easy to access. A study of ten years or so ago looked at the potential of including reference to the well on the local tourist trail, but nothing seems to have come of it, probably on safety grounds, and the vicar, as he locked up the church after the wedding, warned me to take care getting down there. Having dealt with the likes of Ffynnon Fair by Aberdaron, however, Ffynnon Badrig offered few problems. 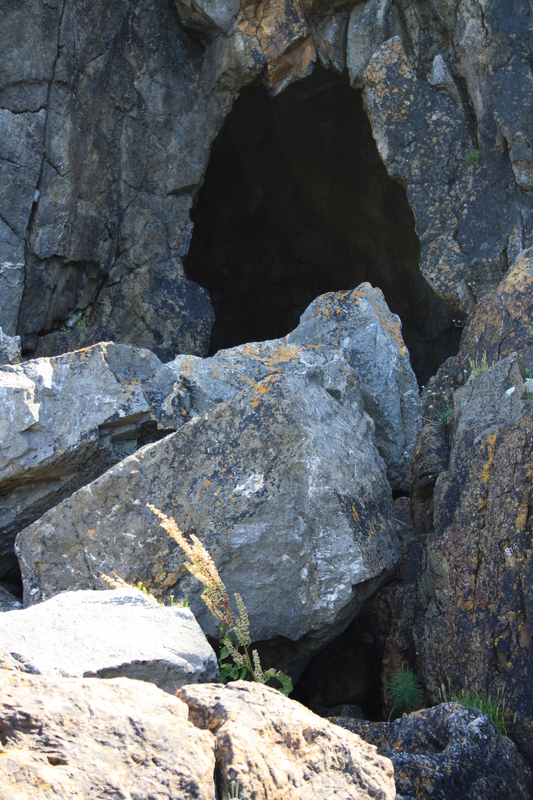 A steeply sloping track close to the stile leads down to the rocks around Patricks cave, Ogof Padrig. On the way down you should look out for the imprints of the saint’s feet in the rock, I don’t think I spotted them. The cave might have provided a welcome refuge from the storm, but filled with massive boulders it does not look like a place that any saint would want to live in for long. There is though that important fresh water spring. Possibly more than one, since pools of fresh water are dotted around the area, flowing through channels in the rocks down to the sea. 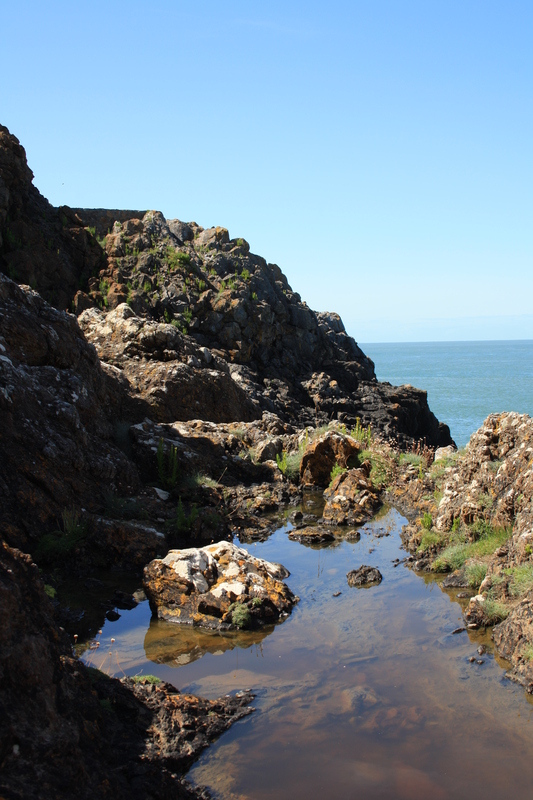 There is one large pool formed in a rocky cleft on the path, visible from the top, as you climb down. This is fed from a small spring in the rocks. This I initially take to be Ffynnon Badrig. There are some accounts place it below the cave and there may be a spring within the case itself although i couldn’t see any evidence of it below the large rocks on the cave floor. There are certainly substantial volumes of fresh water running in pools and streams in front of the cave. Is one specific pool then Ffynnon Badrig? There is no evidence or record of any structure having existed that might point to specific use. I suspect that in its modern interpretation it is the body of fresh water in its entirety that forms Ffynnon Badrig, whether the source of this is a single spring or two or more springs drawing from the same subterranean source. 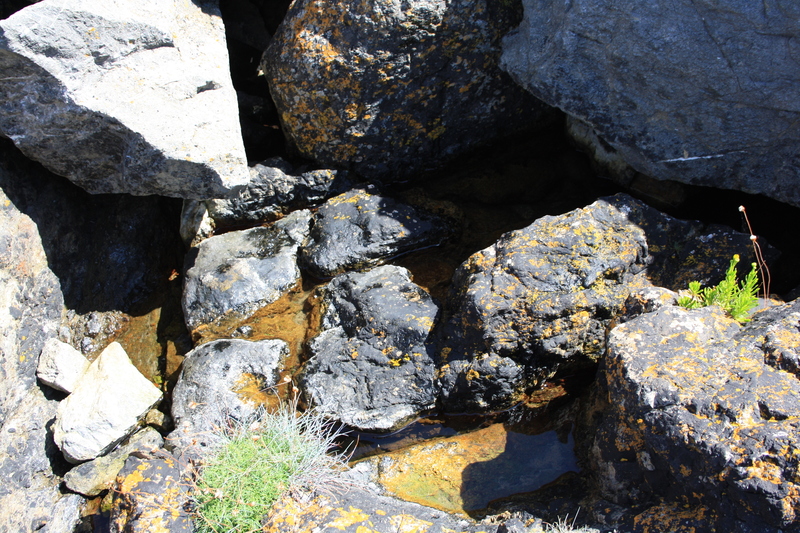 This is water from the springs below the cave which flow down towards the cliff edge and into the sea. from existing documentation I believe that this body of water best represents Ffynnon Badrig. Ffynnon Badrig was well known in older times. The Gruffydd’s  tell us that its water was once in demand for treating the disorders of children and that it was bottled and sold in fairs and markets across Anglesey. It was also claimed to be effective for rheumatism and toothache. The Gruffydd’s book also suggests that there is a second Ffynnon Badrig in the east of the parish near Northwen. I have tried tracking down this spring but as yet have been unable to pinpoint it. Francis Jones(1954) . Holy Wells of Wales. Cardiff UP.